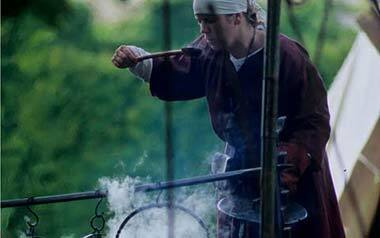 With over 25 years of experience, Vikings of Middle England are able to offer a wide selection of complimentary services to bring to an event. We have an extensive and varied Living History Display which can include everything from the small tented encampment of the roving war band, to a more extensive "Village" incorporating our many crafts displays and information points, or even a full-size stockade, where its defenders are awaiting the onslaught of the forthcoming siege. We are probably most famous for our frighteningly realistic, exciting and entertaining combat displays; the thunderous clash of steel as opposing forces meet, war cries mingling with the screams of the dying, the visual effect is visceral and stunning. Amongst our services we can also offer special effects, evening performances, linked scenarios throughout a day to add to a particular date or celebration, smaller dramatic pieces, sound & PA support and educational visits - and perhaps even more - please don't hesitate to ask! 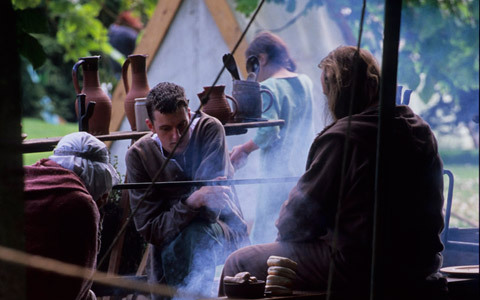 We aim to make our Living History displays breathe, as the Viking-Age families and craftsmen go about their daily routines from cooking and weaving to blacksmithing and wood turning. 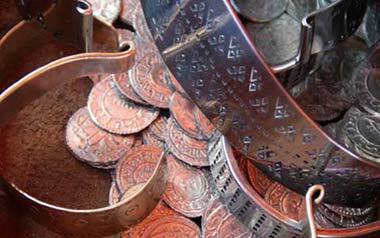 Many of the craftsmen also produce goods for sale and this adds yet another dimension to the exhibits as the true feel of the Viking age market permeates. The audience is invited to walk into the living history area and see the various activities and artefacts at first hand and in some cases to have a go themselves. There is always a member of the society on hand to answer any questions. Take a closer look at the many displays we currently offer here. 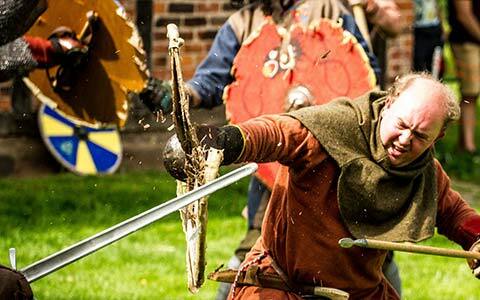 Our fighting routines are a carefully balanced mix of flamboyant and rehearsed combats and unscripted "free fights", where the warriors gritty determination and extensive training in the use of the weapons of the Viking age come to the fore. Combat displays can be sized to suit your event; a small number of highly skilled, trained and rehearsed warriors can provide much higher quality entertainment and suit your event better than would vast numbers of amateur participants. 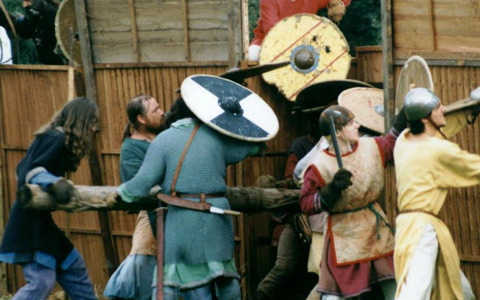 At larger events, Vikings Of Middle England may be able to erect a stockade or other fortification and use cavalry to add an extra dimension to the display. 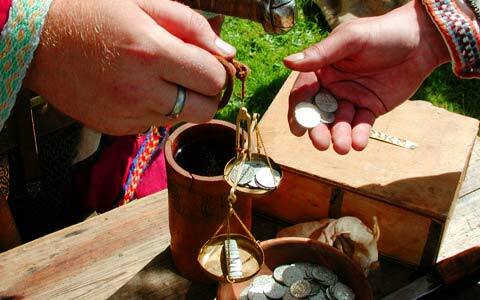 Have a go at striking your own replica Viking or Saxon coin, and learn a little about how money was used, what it could buy and the penalty for stealing! Learn how food was made! Throughout the day, food is cooked, wood for the fire is chopped, and the Vikings eat - everything that you'd expect from a canteen! Illuminate your own letter with authentic inks and a quill. 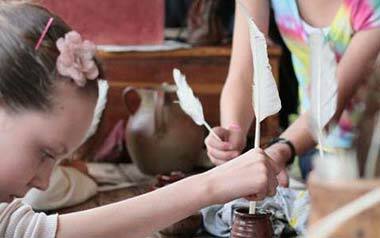 Learn how the Saxons wrote, how they made ink and who could read and write. 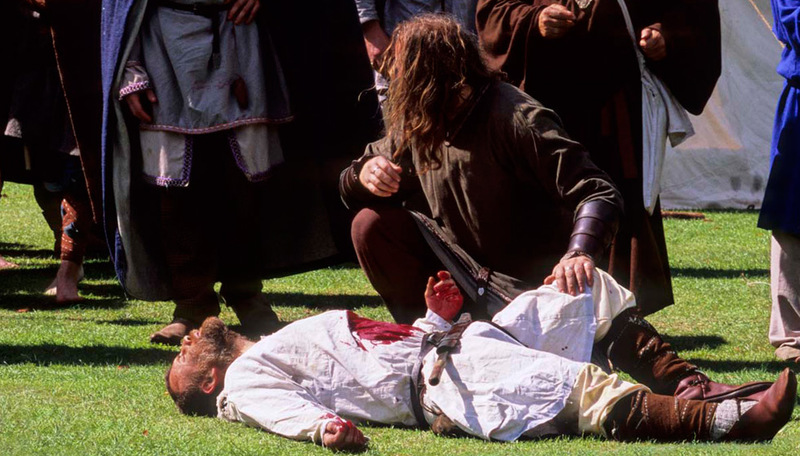 Visit the Lach and discover the gruesome reality of Viking age medicine. He'll cure you of all sorts of ailments but don't complain about his bedside manner! 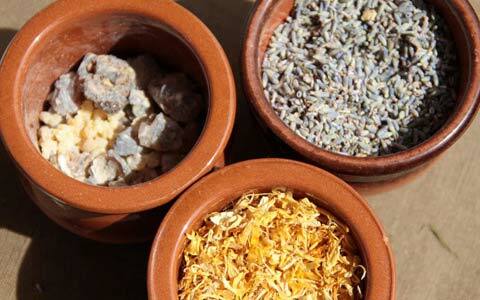 Speak to the wise-woman about how people in the Viking age self-medicated, and the superstitions and facts surrounding different herbs, fungus and spices. 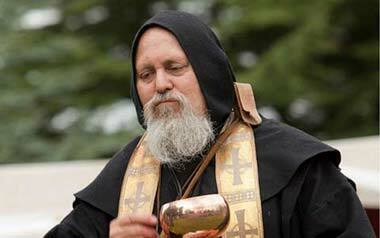 Experience the power of the Christian Church in the everyday lives of our ancestors as Father Abbot gives sermons and raises alms for the poor. 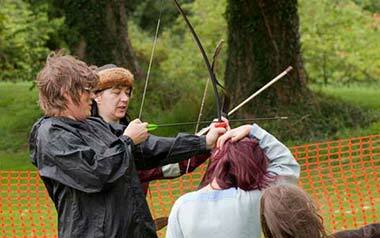 Try out the different weapons that the Viking and Saxon warriors used. 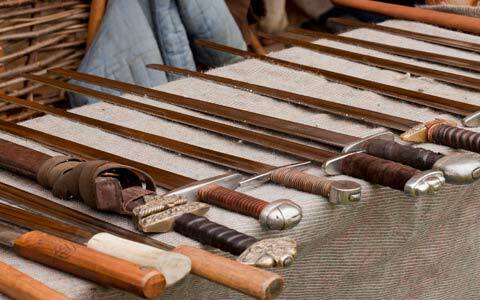 Swords, Axes, Shields, Spears and more are here for you to see! Test you skill at games and puzzles! Can you beat the Vikings at Mills? 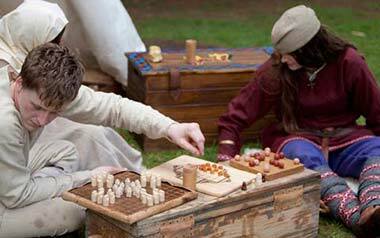 At Hnefatafl? Trip Trap Troll? 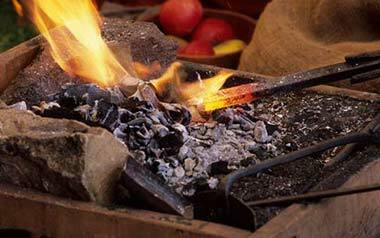 Try all sorts of Viking games, and some you might already know! Watch as Yngvar the Smith makes all sorts of iron objects throughout the day. Arrow Heads, Knives, Axes, Locks - if it's made of iron he'll be making it. 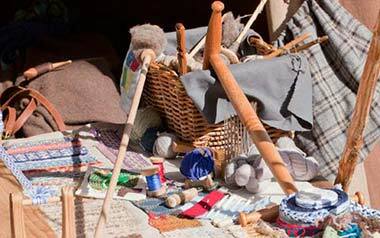 See how the Vikings spun yarn, dyed colours, made cloth on a Warp Weight Loom and wove colourful braid to decorate their clothes at the textiles stall. Have a go at shooting a target with a Longbow, or an easier to handle modern bow at our hugely popular and informative Archery stall. 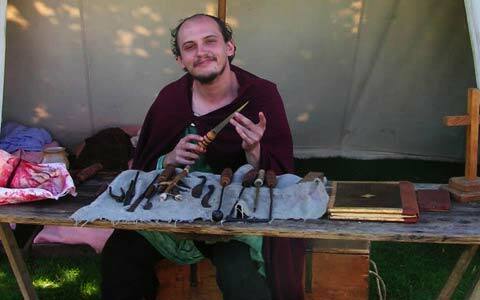 Take a souvenier Viking pendant home with you as our whitesmith and trader is on hand to demonstrate how jewellery is made with precious metals and stones. Over the years, Vikings of Middle England has been able to perform the siege warfare of the Vikings. The Saxons have built a stockades to try and thwart the Viking incursion, but often find themselves bombarded with arrows, jars of burning oil and full scale charges to get over the wall. Siege warfare is a truly memorable addition to a performance. 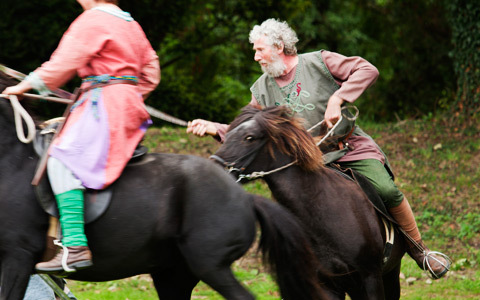 Working with Oakfield Icelandics, members of the Icelandic Horse Society of Great Britain, we have been able to field truly authentic Viking horses on our battlefield, as well as displays of the famous tolt. In fact, Vikings of Middle England were the first society to replicate the reality of a Viking cavalry charge in 1000 years! Horses really add an extra dimension to the event. Over the years we have developed our own unique method of presenting history to the audience. Using a rolling scenario format, we are able to combine dramatic scripts, formidable combat and improvisation in a professional and convincing blend of education, entertainment and excitement. This formula has proved most successful and in part accounts for the high profile and excellent reputation that the group enjoys. threading events together and weaving a superb story is what adds extra value to our displays - no one else offers this polished and highly entertaining format. Vikings of Middle England is renowned for its use of special effects and attempts to present History with as much realism as possible. War was, and is a vile, horrific and bloody spectacle. A Viking age battlefield would have been smelly, phenomenally noisy and reminiscent of a charnel house. 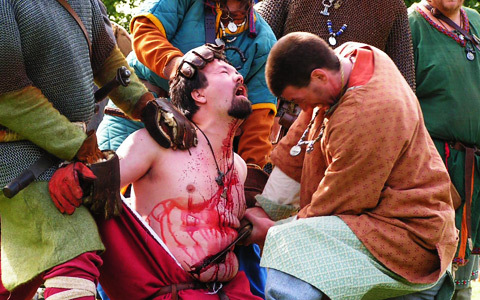 Spectators are not spared the grisly details - whether it be the gore of the battlefield or the treatment of wounds in the rudimentary 'surgery' within the living history camp. However, the group is not insensitive to the needs of the customer, and displays are always tailored to clients' wishes. If so instructed, SpFX can be omitted. The SpFX department offers more than the basic blood-bags used in battle. The treatment of slashes and gashes to arms and legs, cauterisation and dentistry can all be recreated on the lach's (surgeon's) 'operating table'. Lepers and sore-infested beggars may also be seen on occasion. Among the rarer spectacles are hanging, disembowelling and tongue removal. The ever-growing selection of props currently includes a full-size rotting corpse, (affectionately known as 'Kenny') often seen hanging from battlements or gibbet. The surgery has been augmented with an amputated hand and foot, removed because of the horrendous injuries sustained. A film-quality disembodied head may regularly be seen displayed atop of a spike or featured in a scenario. The reliquary box in the Saxon chapel contains a realistic mummified hand and head, whilst the Mint has displayed above it the decomposed hand of a former incumbent, who had struck debased coinage and suffered this punishment according to the 11th century laws of Cnut. Copyright © 2017 Vikings of Middle England. Website designed at sword point by Alan 'Kael' Ball.